The term preoptic periventricular nucleus refers to one of five predominantly cellular parts of the preoptic area as defined by Nissl stain. 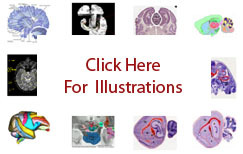 It is a narrow, vertically oriented cell group bounded medially by the upper body of the third ventricle, laterally by the medial preoptic area, and dorsally by the median preoptic nucleus. It's ventral extent and adjacent structures vary depending upon the species: human ( Mai-1997 ), macaque ( Martin-2000 ), rat ( Swanson-1998 ). and mouse ( Hof-2000 ). The preoptic periventricular nucleus is continuous caudally with the more ventrally located intermediate periventricular nucleus ( Saper-1990 ).